A young football player with no Division I-A football scholarship offers shuns smaller schools, walks on to a big-time football program, and before it is all over, against all the odds, he wins a bowl championship, starts his senior season, and walks away with the cheerleader on his way to a successful life in corporate America. Though it sounds like the makings of a 20-something sports fantasy film, it is the real story – more or less – of former Pirate wide receiver Pete Zophy. 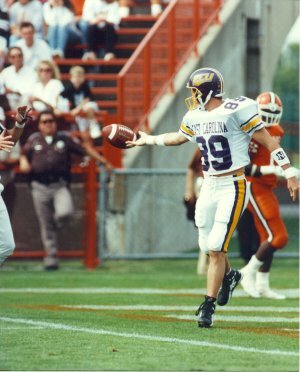 Zophy, who donned the Pirate gear from 1988-92, was one of a long line of ultra-talented receivers at ECU. He learned the trade from the likes of Walter Wilson and Al Whiting, honed his skills alongside Dion Johnson, Clayton Driver, and Hunter Gallimore, and laid the foundation for the talents of Larry Shannon and Mitchell Galloway. Yet, among that elite group, Zophy’s contribution to the ECU program was a bit different. He was the quintessential role receiver in an offense so complex that, to learn one wideout position well is considered an accomplishment in itself. For Zophy, learning all three positions was his only way to engineer himself an athletic grant-in-aid. “I had really good hands,” he said. “I could catch everything within reach and I pretty much had to. As a player in Fairfax, VA, Zophy was being looked at by primarily Division I-AA schools like James Madison and William & Mary, the latter being the only team to offer him a scholarship. “You know, I would have gone to William & Mary,” Zophy said. “But, they called me and told me that I didn’t meet the academic standards. Basically my SAT score was not high enough. An All-Region selection in the brutal Northern Virginia area, Zophy was certain he could play Division I-A football. He took his 6-0, 175 pound frame – and blazing 4.8 speed – to ECU. But it was his sure hands, his ability to learn the complex Pirate offense and his willingness to play a role that endeared him to the coaching staff and, ultimately, put him on the field. During his junior season, he was the first receiver off the bench for all positions. Pete Zophy flips the ball to the referee after a TD. Zophy has heard all of the comparisons between himself and Gallimore and he takes it as a compliment. The Peach Bowl ring came in his junior season, but it was in the summer preceding that wonderful season when Zophy received his greatest inspiration. It was that summer that he met his wife, Heather. 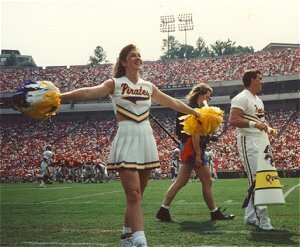 A cheerleader from 1988-92, Heather arrived on campus early with the cheerleading team, and she and the wide receiver met before the general population returned to school. 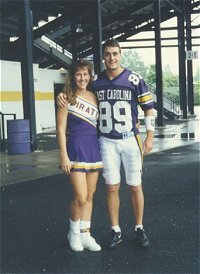 Pete's greatest inspiration, an ECU cheerleader named Heather. “I met her the summer of Peach Bowl year,” he said. “I was in camp for football and she was with the cheerleaders. We started going to lunch and talking and then started dating that year. It was pretty cool and, because we were winning, no one really said anything. It was a relationship that took. And, Zophy got his cheerleader. After eight years at Overton's in various marketing positions, Zophy has moved on and up in the corporate world. Today, he is the Vice President of E-Commerce at Joseph A. Bank Clothier in Westminster, MD, and his wife, who spent eight years as a Health Educator at ECU, now has settled in to raising their two children, daughter Connor and son Cade. “I owe part of my success to football. Football brought me my first job in the business world,” Zophy said. “My marketing professor (Jeff Barnell) was Vice President of Marketing at Overtons. "He was… is… one of the biggest ECU fans and we would talk football after class. So, when I was in MBA School, he offered me a marketing internship. Then, Jeff hired me full-time when I graduated. Another thing football taught him was that he has never worked so hard for something he wanted. He takes solace in drifting back to those days when life gets tough today. When he recalls how tough it was at ECU, it makes things much easier to deal with at work. Life is good for Zophy these days. 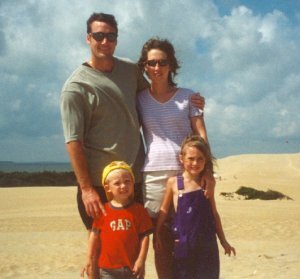 Zophy with his wife, Heather, and children Cade and Connor. But, Zophy also is still an athlete. Zophy, who grabbed 44 catches as a senior with five TDs, thinks that there is something to learn from each player that comes through the program. “For the guys just entering the program, hopefully, they can look at careers like mine and see how perseverance and finding your role on the team and being the best you can be at that role can allow you to earn that scholarship. “For me, it helped me earn a scholarship, get that bowl ring and meet my wife. That is what ECU was to me. Zophy keeps a 1991 picture of a group of Pirates, including himself, holding the Peach Bowl trophy and a purple can of Pirate Cola on his desk. It reminds him of his hard work and his dreams… and nothing seems impossible. After all, Zophy got the ring and he got the cheerleader. “Virginia Tech, but not because of the recruiting thing. No, it was because they were a little bit arrogant there. Their fans were overly obnoxious. It does make it hard to win there, but it also makes it even better when you do win there." Click here to read what Pete Zophy has to say about East Carolina's complex offense.